At our English summer camps we teach English through drama, songs and games. The children are immersed in this mode of learning from start to finish. TEATRINO is Italy’s largest Theatre In Education (T.I.E.) company which hires 30 young, energetic performers who love working with children to tour across Italy. Are you a mother tongue English speaker? Do you love working with children? Do you want to come to Italy for a wonderful teaching experience? Send us your application! Join us in Bella Italia! Since 2006, Educo has completed over 1000 summer camps, 30,000 workshops and theatre sketches, involving over 100 000 students per year. EDUCO is a Trinity College London center and is exclusive to the Trinity Stars Award Camps. Educo is accredited by MIUR (the Italian Ministry of Education) for the training of teachers of every order and degree. 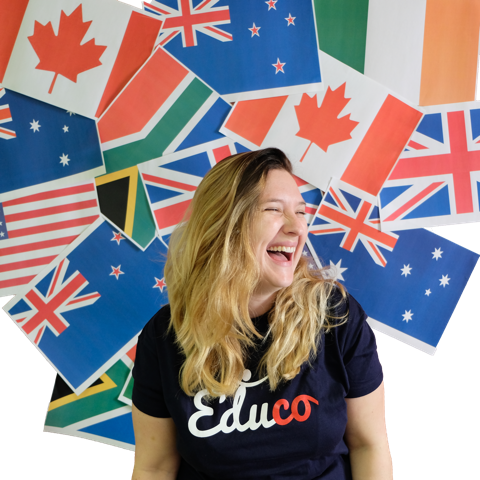 Our tutors come from all across the English speaking world, including Great Britain, USA, Australia, New Zealand, Canada, Ireland and South Africa. Working for EDUCO means working with people from a variety of backgrounds and experiences, united by a passion for education. Dream of finding full time teaching work in Italy following our program? We collaborate with dozens of language schools and hundreds of teachers across the country. Everyone who works for us will automatically be informed of job opportunities as they arise.